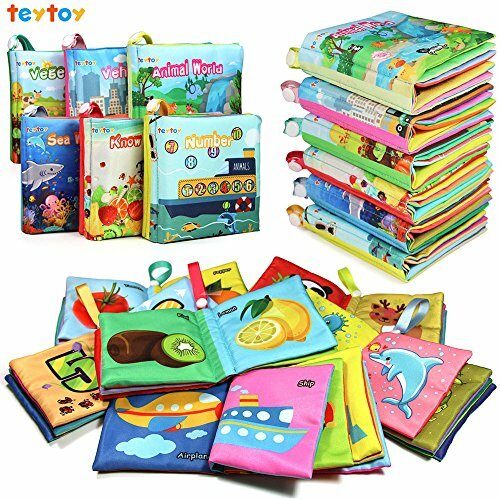 Set of 6 Baby Cloth Books -- Nearly 60% off with Coupon Code! Ships FREE! Set of 6 Baby Cloth Books — Nearly 60% off with Coupon Code! Ships FREE! Clip the extra 5% off Digital Coupon before you check out! ♫ ELIMINATES THE NEED TO WORRY ABOUT YOUR CHILD WHILE "READING" THEM - Because babies put everything into their mouth, the quality of this book is extremely important. Our cloth book is totally safe for your baby:non-toxic, strong stitching, washable. ♫ CAPTURING YOUR CHILD'S ATTENTION JUST GOT A LOT EASIER - These baby book toys has tons of super-fun characters, vibrant images with vivid patterns and colors, packed full of educational activities for children to enjoy. Perfect for infants to toddlers. It gives your child endless hours of fun! ♫ GIVE YOUR CHILD A FLYING START -Reading this soft book gives you a chance to bond with your baby, a warm moment together. At the same time, It is an early development toy: a wonderful way to stimulate important key skills, like language & reading skills, communication skills, imagination, sensory skills, all.